Sgt. Cooper knew he was not very popular with his officers right now. A young dragon had invaded Chi Town and had managed to find its way into one of the secret vaults and managed to get away some items that the High Command wanted out of the hands of evil forces. He had been reassigned to patrolling the lower levels for D-Bee pests which were constantly finding their way into the city. He was not assigned to go after major menaces, just creatures like Faerie and other similar creatures. He had heard rumors of some bushy tailed small dog like creature that had been wandering around the lower levels. There was also an official report of a similar creature stealing food from a general's table and then appearing to just simply vanish. He knew his uniform and armor was far from clean from tromping around in the filth but there was little he could do. He hoped that he would be 'forgiven' soon and be able to go back to the real military. Assigned with him were two dog boys whose job it as to sniff out any supernatural creatures. They were pretty mangy mutts and it was obvious that they were not much more popular than he was. The armor they wore was not much better than his. They had caught the elusive scent of something several times but each time, they lost the scent. The trail just often just seemed to dead end with a wall. Often times, if they were able to get into the room or corridor on the other side of the wall, they were able to pick up the trail again. Still, they had been after this creature for hours and were getting very foot sore. As tired as they were, none of the three trackers could figure out where they might have seen something like this before. They had gone through both the military facilities below chi-town and the very poor sections and there seemed no hope of finding this creature anytime soon. Suddenly, they came around the bed and saw a brownish red animal with a white tail and a white face. 'What the heck was a fox doing in the middle of Chi-Town' thought Sgt. Cooper. Just then, the Dog Boys point and growled "That is it." He drew his pistol and prepared to fire at the creature but it ran down the corridor and he could not get a good shot at it. He ran after it although the two dog boys easily outran him. They had to get that thing before it caused more trouble for him. It lead him on a merry chase but they had it cornered. Suddenly, it went through the wall. One of the Dog-Boys bumped his head against the wall trying to grab the creature. He had stories of people called 'Psi-Ghosts' who could do that but he had thought the stories were fantasy. He raced back to the door which would allow him access to the chamber on the other side of the wall that creature had passed through. As he stepped through the doorway, the fox just sat there staring at him and the dog boys. It had made a nest from some materials inside the room which was as unused barracks. He pulled his laser pistol and fired at it. The laser passed right through. The creature then ran toward the hunters and right through another wall. It was playing with them. They gave chase. Luckily, they knew the lower levels very well and where the fox had gone now. They caught up with it only to have it run away. Finally, thinking they caught it, they caught it in the middle of a wide open chamber. He had heard that Psi-Ghosts were susceptible to gas so he pulled the pin and threw a knock out gas grenade at it. It dove into the floor. He realized that they were right over Karl Prosek's chambers. He said to himself "I wonder what High Commands punishment for this will be." The two dog boys turned to him and their ears drooped. Most 'normal' animals have found themselves having a harder time survive since the coming of the Rifts. With monsters hunting them, even once fearsome predators find themselves on the losing side. Luckily, supernatural creatures are not all the common. Man has been able to survive in the new environment due to his tools. Some creatures have been able to survive as scavengers around humans and other predators. As well, some creatures were changed by the magical energies which they caught in when the Rifts appear. Foxes have done fairly well for themselves since the coming of the Rifts. They eat small animals which are normally not hunted by the supernatural creatures and they are adept at hiding when supernatural creatures try to make them into prey. As well, they have taken advantage of human habitation and have moved into human cities living off the vermin and scavenging when necessary. Still, their existence is not an easy one. Phase Foxes are different. They are incredibly well adapted to the Rifts world and can survive almost everywhere. It is believed by some scholars that a family of foxes got trapped in some type of magical rift when the world was consumed by magical energies. The magical energies changed the foxes, making them smarter, enhancing their psychic abilities, and giving them the ability to become intangible or 'phase' like a psi-ghost. As well, they are much longer lived than normal foxes. A normal red fox rarely lives more than six years but mutant phase foxes have been known to live up to thirty years. Still, they are not super tough or strong but their ability to become intangible makes them almost impossible to hurt. This new breed of fox is even more playful than normal foxes but generally keep similar habits, often living in burrows. Dens vary as much as they do for normal foxes and phase foxes will use hollow trees, under human dwellings, and even in tall grass. In many cases, the hiding places of the phase foxes are completely closed except for passages for air and the foxes have to phase to get into their den. Until Cub or Baby Phase Foxes open their eyes, they cannot phase on their own but the parents can carry their offspring while intangible if they to escape to a new home. All phase foxes can interact with each other while they are intangible. Phase foxes can only breed true with other phase foxes although the few cases of offspring between normal foxes and phase foxes are exceptionally intelligent. Phase foxes seem to intuitively find other phase foxes to breed with. The first phase foxes known appeared in North America just after the destruction of civilization but appear to have spread throughout the continents. There are now believed to be phase foxes in Europe and England. They are not known to be found in any other worlds but many scholars / scientists consider it to be only be a matter of time. Some phase foxes seem to prefer rural environment while others appear to prefer cities. There are stories of phase foxes even being found in Chi-Town. There are no real ways of stopping phase fox from stealing small livestock such as chickens but they can usually be bribed with bits of food. They also have been known to steal food right from storage cabinets and cooler units. Electricity affects them and there are a few magic wards which can be used to protect from phase foxes and they will avoid such locations once they get burned. They also appear to have supernatural feeling of danger and can avoid most traps. An electric fence is of limited effectiveness because the will simply go intangible and travel underground until they get where they want to go. A phase fox does need to go solid to pick anything up or attack so they are not considered very dangerous to large creatures such as humans. They will tease and play tricks on humans if they think they can get away with it. They are generally not malicious and will not kill more than they need for themselves or their offspring. Because of this, most consider them to be a minor pest at worst. Most Phase Fox appears to be a normal red fox and it is likely that the red fox was the original fox that they mutated from. They usually have red fur with a white (or light yellow) face and tip of their tail. Also, black paws are common. Eyes of the foxes are normally brown. There is some variation in coloration with some having a mutation of all white fur which are often mistaken for Arctic Foxes. It is believed that it is a recessive trait which was brought out through the initial small gene pool. In addition to having white fur, the unusual white fox usually have blue eyes. While intangible, the phase fox has a ghost like appearance. The Phase Fox tends to be slightly larger than common red fox but is still within the upper range for them. One of the most interesting quirks about phase foxes is that they will often make friends with other creatures with the ability to become intangible. Several psi-ghosts have phase foxes as companions and the loyalty is very strong. With empathy, they can even communicate and in some cases, the phase fox will work to distract guards while the psi-ghost works to steal the loot. Otherwise, the phase fox cannot be trained and are very independent. It is as if the phase fox considers others who can phase to be large members of their phase fox families. In general, most humans and other sentient beings with the ability to become intangible also feel a kinship with phase foxes. Natural Abilities: Night vision 120 feet (36 meters), keen vision and smell, prowl 75%, swim 60%, streetwise 50%, climb trees and rocks 55%, track by smell 55%, can leap 4 feet ( m) high and 6 feet ( m) across, and like most Canidae can perform a leaping pounce. Intangibility: The power of intangibility affects the bonding element of molecules, making the fox and 4 pounds (1.8 kg) of additional material intangible. Intangibility means that sticks and stones, punches, bullets, lasers, and most conventional attacks pass right through; harmless, like a ghost. However, the Phase Fox is not invulnerable to all attacks. Electricity, which stimulates and agitates molecules, does half damage. Psionic attacks have full effect. Gas attacks are particularly effective, as the gaseous substance passes right through and into the blood stream, doing full damage/effect. The intangible fox can not touch, pick up or carry anything, but can bark and hear as normal. The fox can walk through any substance, stone, steel, earth, machines, etc., without affecting it. Although the animal can not glide or float, falls or explosions can not harm him. Because of the intangible state, the fox can sink into the earth/ ground up to its nose and walk on the dense molecules, effectively walking through the earth. Likewise, the fox can actually walk on the dense molecules of smoke and water. Just as the animal can not pick up or touch any object or person, it can not engage in combat. Any blows would pass harmlessly through the fox. Nor can the fox partially materialize or materialize a portion of its body. To materialize while partially in an object will result in instant and painful death. The animal can become tangible or intangible nearly at the speed of thought; four times per melee is the maximum. While intangible, the fox seems to be semitransparent, almost specter-like. The animal's appearance alone can be quite harrowing; Horror Factor of 8. Note: +20% to prowl skill when intangible. Bonuses: +3 to strike, +5 to dodge, +5 to roll with punch, fall, or impact, +4 to save vs Horror Factor, and +4 to Initiative in addition to attribute bonuses. Damage: Bite does 2D4 points of damage and claws inflict 1D3 points of damage. Average Life Span: 30+ years. Value: The Phase Fox is untamable and will virtually always escape so does not have any value as pet. The creature is almost impossible to catch so the animals in not hunted for furs. Habitat: Very excellent opportunist and can be found virtually anywhere, from arctic regions to woodlands, farmlands, grasslands, and even towns and cities. 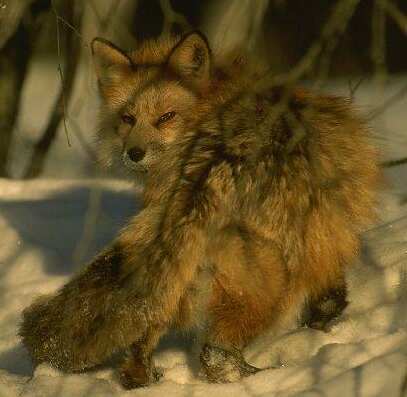 Range: Ninety-five percent of all phase foxes are found in North America; However, some have found their way into South America, Europe, and England. Diet of the Phase Fox is diverse and includes small mammals, rodents, birds, fish, invertebrates including earthworms and beetles, and even fruit when it is available. They will also scavenge when they find it available. The are excellent foragers using a variety of hunting techniques including stealth and dash-and-grab. They use their phase ability to great effect but have to become solid to grab their prey. They will cache food for later use like regular foxes and will hunt in human area as well. While the common conceptions of Foxes are as solitary creatures, this is not correct and normal red foxes are known to gather in groups of up to six adults. Phase foxes are even more social and groups of up to a dozen are believed to share communal dens. In dens, other foxes will often help with the raising of cubs. While red foxes share this trait, this is far more refined in phase foxes. The number of cubs born is usually smaller than normal red foxes, usually two to four young compared to four to eight for most red foxes. Gestation is also a bit longer than red foxes, averaging around eighty-five to ninety days.